Production company A24 have developed a pattern of releasing a horror movie that dazzles at film festivals and ultimately become instant classics in the eyes of horror fans. The track record speaks for itself with 2016’s The VVitch and 2017’s It Comes at Night both living up to the hype built behind them. Can Hereditary continue the streak or has it been overhyped? Annie Graham (Toni Collette), her Husband Steve (Gabriel Byrne) and their two kids Charlie (Milly Shapiro) and Peter (Alex Wolff) cope with the death of Annie’s estranged mother Ellen. Supernatural events and a horrific tragedy heighten the tension within the family and Annie is at the center of it. 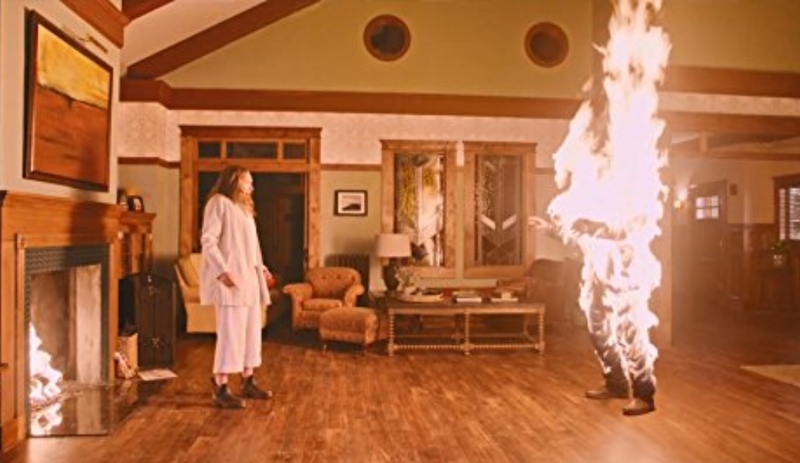 Hereditary takes a look into the not so uncommon idea of Generational Curses or Family Curses that many people seem to believe in. This is shown a bit within the movie as Annie divulges odd info of how her parents and brother have suffered and how her mother has controlling during a support group meeting that suggest her life was less than normal. The real scares and horror are few and far between, but when they happen they stick with you. I’m grateful that the jump scares that many horror movies uses as a cheap tactic are only used maybe twice. There is one scene that will probably stick with me for some time. It was something gruesome and heartbreaking. I’m not a whimp, but this particular scene and the aftermath of it will go down in my top 10 moments in movies. But after that moment, things don’t ramp up till about the last 30 minutes of the film. The movie uses atmosphere really well and cinematography is used effectively, but there are a few shots that last longer than needed. Majority of these types of shots slow down the movie to a point were I was somewhat bored.Rather its Annie walking through buildings or taking part in her hobby of creating miniature dioramas or Following Peter’s exploits in school. Toni Collette was fantastic in the lead role. Her rage and erratic behavior in a scene were she unleashes anger had me wanting more. There is another moment that commanded great emotion that I couldn’t have been delivered more perfectly. I could not stand Alex Wolff as Peter. A teenage stoner that seemingly reverts to a child during moments of dread. I knew teens like that and I guarantee none of them would react the way he did in certain moments, no matter the danger. Hereditary is a great addition to the ever growing library of indie horror brought to us from A24, I find it hard to anoint it an instant classic. Moments of meandering slow down the pace.